The Band was formed in 1950 by Cliff Williams who was a local cubmaster. Cliff brought together 6 scouts, 3 playing bugles and 3 on side drums. 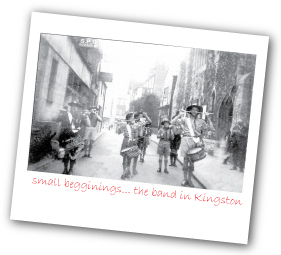 The Kingston District Scout Band was seen at its first public event in April 1951 at Kingston’s St George’s Day Parade. Around this time, the band’s uniform was the famous Baden Powell hat, khaki shirt and shorts (knobbly knees! ), blue socks, garters and group scarves. By 1960’s the band had grown in size and was playing regularly at local fetes and Scout events. The uniform changed (the first change of many to come! ); hats were replaced by berets; shirts and socks changed to white and the first band scarf – green with white lanyard – was introduced. It was not until the mid 1960’s that the band started to enter competitions which included the first National Scout Band Festival held at Nuneaton. The band was placed second to last in the novice class – an auspicious start! For the next two years the band worked hard on a new display and was rewarded at the 2nd Scout Band Festival held in Brighton with 1st place in the Novice Class. The taste for competition had started! In 1967 the Band changed its name to the “Kingston & Malden District Scout Band” following the incorporation of the Malden & Coombe District within Kingston. The 1970’s saw real progress being made in terms of music, membership and instrumentation. Bugles were replaced by trumpets and upright bell lyres were introduced. This allowed the band’s repertoire to increase and become far more entertaining. A full range of valved brass instrumentation improved this further. The band was increasingly invited to more prestigious events. Band members were invited to participate in the Lord Mayor’s Parade as part of a Greater London South West County Scout Band. In order to prepare for this our first training camp was organised during the winter at Walton Firs Scout Campsite. This is now an annual feature of the band’s activities and is held at the headquarters of the UK’s Scout Association, Gilwell Park. The uniform changed to green shirts, long trousers, white belt and gloves along with a new band scarf – red with a white border. Cubs were allowed to join the band as learners, normally starting on the cymbals. During the 1980’s Guides and Brownies became eligible to join the band and the name was changed to “Kingston & Malden Scout & Guide Band”. The band grew and developed and was awarded an “A Grade” by the Scout Association. This is the highest grading a Scout band can achieve, and the band continuous to hold the standard to this day. We were honoured to take part in the Queen’s 60th Birthday Parade down the Mall in April 1986 and subsequently appeared on Thames Television. This was followed by appearances at the Royal Tournament in 1986 and two more Lord Mayor’s Parades in 1986 and 1987. At the end of the 1980’s the band started to take the competition circuit more seriously entering a number of BYBA contests as well as non affiliated contests, including the Royal Albert Hall competition. There were continued appearances at the bi-annual National Scout Band Festival; in 1988 the Band won the Championship class (and followed this up by wins in the Contest Class in 1992 and 1994). The band’s musical style continued to evolve to suit these more important events whilst still maintaining entertainment as the central aim. The repertoire included tunes such as “Uptown Girl”, “Popcorn”, “March of the Siamese Children”, “He ain’t heavy”, “Imperial March”(from Star Wars),”The Great Escape”, “For Your Eyes Only”(from James Bond), “The Hustle”, Petula Clark’s “Downtown”, the classical “Karelia suite”, Barry Manilow’s “I Write the Songs” and Frank Sinatra’s “Fly me to the Moon”. The late 1980’s saw further band uniform changes. Scout members of the band began to wear beige Venture Scout shirts whilst the Guides wear blue blouses. Headgear was also dispensed with. At the start of the 90’s, with greater emphasis on BYBA competitions and the relaxation of Scout Association rules on band uniforms, the band introduced a new style competition uniform. The competition uniform comprised of a red Australian style hat, white shirt, red cravat and cummerbund, khaki trousers or skirt and black shoes. This gave an identifiable coordinated image to the whole band. Geoff Mynott had joined the band as a Scout at its formation and went on to become its Bandmaster for over 30 years. He retired from this post in December 1995 and became Honorary Life President. Sadly Geoff was unable to attend the band’s 50th Birthday Concert, held in Kingston’s prestigious council chambers, and passed away in June 2000. A much greater variety of instruments was introduced including quad drums, clarinets, mellophones, saxophones and xylophones; in fact it is now the band’s policy to try and accomodate any instrument that a member may wish to try! The introduction of “pit percussion” began to allow the newest recruits to take part in competitions. Now with a much higher profile in the local community the Band has become a regular feature of The Lord Mayor’s Show, London’s New Year’s Day Parade and more local events such as the Malden Fortnight, Kingston May Merrie and at the Kingston Christmas festivities. In 2009 the band was honoured to be asked to perform at Buckingham Palace, representing youth organisations at an annual summer Garden Party. More popular musical numbers have been added to the current repertoire such as “The Thunderer”, “Annie Medley”, “Glee Medley”, “Phantom of the Opera”, “The Muppet Show” and many more. We hope you have enjoyed this brief excursion through our long history!